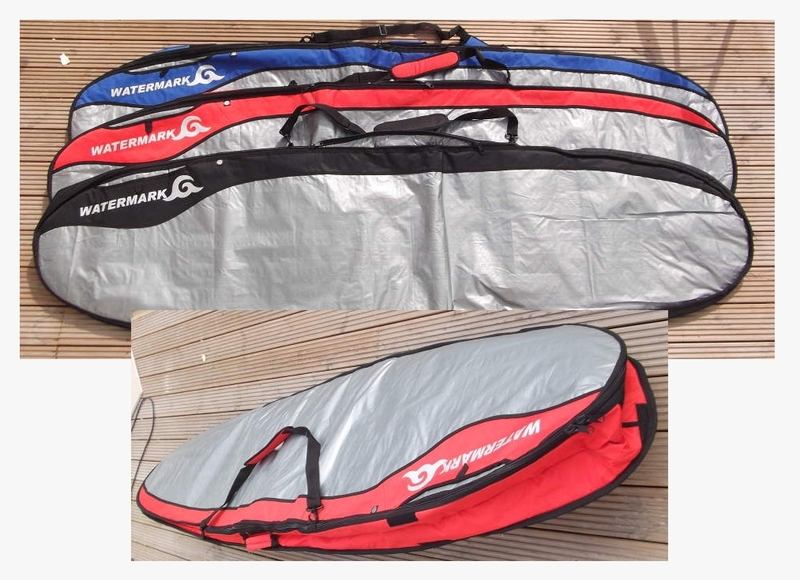 This Watermark short / fish boardbag has a 5mm eva foam core covered with a tarpee/nylon shell. Small side pocket, padded shoulder strap, carry handle. It has a raised sidewall which gives added protection and results in a smaller footprint and a raised tail to accommodate fins. This bag will take shortboards and fish shapes of max length 6'5" x 221/2" wide. Available in either blue/ silver, black/ silver or red/ silver. Please advise colour when checking out. This Watermark short / fish boardbag has a 10mm eva foam core covered with a tarpee/nylon shell. Small side pocket, padded shoulder strap, carry handle. It has a raised sidewall which gives added protection and results in a smaller footprint and a raised tail to accommodate fins. This bag will take shortboards and fish shapes of max length 6'5" x 221/2" wide. Available in either blue/ silver, black/ silver or red/ silver. Please advise colour when checking out. 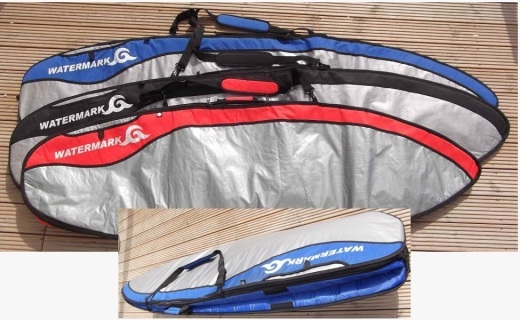 This Watermark short / fish boardbag has a 5mm eva foam core covered with a tarpee/nylon shell. Small side pocket, padded shoulder strap, carry handle. It has a raised sidewall which gives added protection and results in a smaller footprint and a raised tail to accommodate fins. This bag will take shortboards and fish shapes of max length 6'9" x 221/2" wide. Available in either blue/ silver, black/ silver or red/ silver. Please advise colour when checking out. This Watermark short / fish boardbag has a 10mm eva foam core covered with a tarpee/nylon shell. Small side pocket, padded shoulder strap, carry handle. It has a raised sidewall which gives added protection and results in a smaller footprint and a raised tail to accommodate fins. This bag will take shortboards and fish shapes of max length 6'9" x 221/2" wide. Available in either blue/ silver, black/ silver or red/ silver. Please advise colour when checking out. This Watermark short / fish boardbag has a 5mm eva foam core covered with a tarpee/nylon shell. Small side pocket, padded shoulder strap, carry handle. It has a raised sidewall which gives added protection and results in a smaller footprint and a raised tail to accommodate fins. This bag will take shortboards and fish shapes of max length 7'2" x 23" wide. Available in either blue/ silver, black/ silver or red/ silver. Please advise colour when checking out. 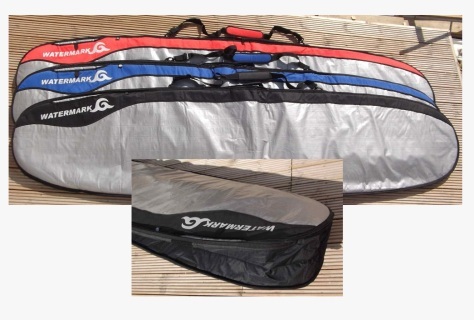 This Watermark short / fish boardbag has a 10mm eva foam core covered with a tarpee/nylon shell. Small side pocket, padded shoulder strap, carry handle. It has a raised sidewall which gives added protection and results in a smaller footprint and a raised tail to accommodate fins. This bag will take shortboards and fish shapes of max length 7'2" x 23" wide. Available in either blue/ silver, black/ silver or red/ silver. Please advise colour when checking out. Please advise colour when checking out. This Watermark mini-mal boardbag has a 5mm eva foam core covered with a tarpee/nylon shell. Small side pocket, padded shoulder strap, carry handle. It has a raised sidewall which gives added protection and results in a smaller footprint and a raised tail to accommodate fins. This bag will take mini-mals of max length 8'0"" x 23" wide. Available in either blue/ silver, black/ silver or red/ silver. Please advise colour when checking out. This Watermark mini-mal boardbag has a 10mm eva foam core covered with a tarpee/nylon shell. Small side pocket, padded shoulder strap, carry handle. It has a raised sidewall which gives added protection and results in a smaller footprint and a raised tail to accommodate fins. This bag will take mini-mals of max length 8'0" x 23" wide. Available in either blue/ silver, black/ silver or red/ silver. Please advise colour when checking out. This Watermark mini-mal boardbag has a 5mm eva foam core covered with a tarpee/nylon shell. Small side pocket, padded shoulder strap, carry handle. It has a raised sidewall which gives added protection and results in a smaller footprint and a raised tail to accommodate fins. This bag will take mini-mals of max length 8'6" x 23" wide. Available in either blue/ silver, black/ silver or red/ silver. Please advise colour when checking out. 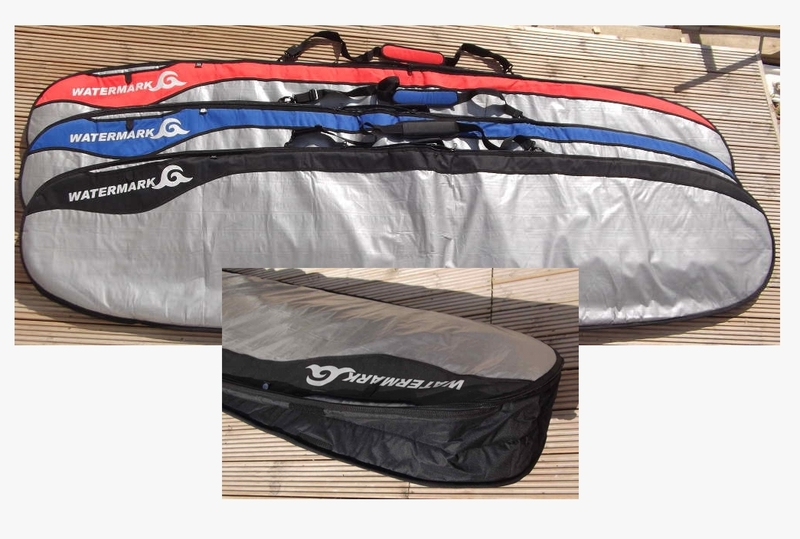 This Watermark mini-mal boardbag has a 10mm eva foam core covered with a tarpee/nylon shell. Small side pocket, padded shoulder strap, carry handle. It has a raised sidewall which gives added protection and results in a smaller footprint and a raised tail to accommodate fins. This bag will take mini-mals of max length 8'6" x 23" wide. Available in either blue/ silver, black/ silver or red/ silver. Please advise colour when checking out. This Watermark longboard boardbag has a 5mm eva foam core covered with a tarpee/nylon shell. Small side pocket, padded shoulder strap, carry handle. It has a raised sidewall which gives added protection and results in a smaller footprint and a raised tail to accommodate all fins inside the bag. This bag will take longboards of max length 9'0" x 24" wide. Available in either blue/ silver, black/ silver or red/ silver. Please advise colour when checking out. This Watermark longboard boardbag has a 10mm eva foam core covered with a tarpee/nylon shell. Small side pocket, padded shoulder strap, carry handle. It has a raised sidewall which gives added protection and results in a smaller footprint and a raised tail to accommodate all fins inside the bag. This bag will take longboards of max length 9'0" x 24" wide. Available in either blue/ silver, black/ silver or red/ silver. Please advise colour when checking out. This Watermark longboard boardbag has a 5mm eva foam core covered with a tarpee/nylon shell. Small side pocket, padded shoulder strap, carry handle. It has a raised sidewall which gives added protection and results in a smaller footprint and a raised tail to accommodate all fins inside the bag. This bag will take longboards of max length 9'2" x 24" wide. Available in either blue/ silver, black/ silver or red/ silver. Please advise colour when checking out. This Watermark longboard boardbag has a 10mm eva foam core covered with a tarpee/nylon shell. Small side pocket, padded shoulder strap, carry handle. It has a raised sidewall which gives added protection and results in a smaller footprint and a raised tail to accommodate all fins inside the bag. This bag will take longboards of max length 9'2" x 24" wide. Available in either blue/ silver, black/ silver or red/ silver. Please advise colour when checking out. This Watermark longboard boardbag has a 5mm eva foam core covered with a tarpee/nylon shell. Small side pocket, padded shoulder strap, carry handle. 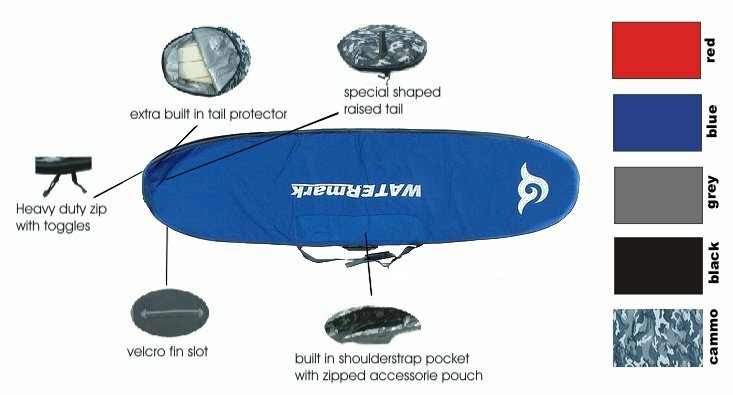 It has a raised sidewall which gives added protection and results in a smaller footprint and a raised tail to accommodate all fins inside the bag. This bag will take longboards of max length 9'4" x 24" wide. Available in either blue/ silver, black/ silver or red/ silver. Please advise colour when checking out. This Watermark longboard boardbag has a 10mm eva foam core covered with a tarpee/nylon shell. Small side pocket, padded shoulder strap, carry handle. It has a raised sidewall which gives added protection and results in a smaller footprint and a raised tail to accommodate all fins inside the bag. This bag will take longboards of max length 9'4" x 24" wide. Available in either blue/ silver, black/ silver or red/ silver. Please advise colour when checking out. This Watermark longboard boardbag has a 5mm eva foam core covered with a tarpee/nylon shell. Small side pocket, padded shoulder strap, carry handle. It has a raised sidewall which gives added protection and results in a smaller footprint and a raised tail to accommodate all fins inside the bag. This bag will take longboards of max length 9'6" x 24" wide. Available in either blue/ silver, black/ silver or red/ silver. Please advise colour when checking out. 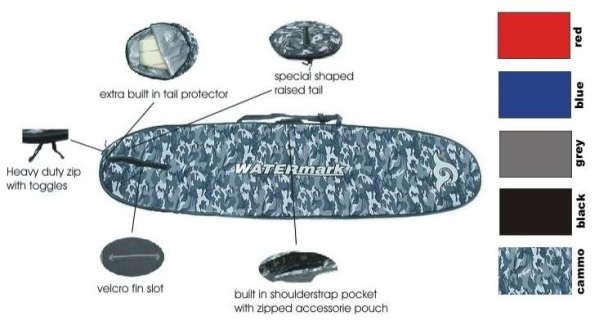 This Watermark longboard boardbag has a 10mm eva foam core covered with a tarpee/nylon shell. Small side pocket, padded shoulder strap, carry handle. It has a raised sidewall which gives added protection and results in a smaller footprint and a raised tail to accommodate all fins inside the bag. This bag will take longboards of max length 9'6" x 24" wide. Available in either blue/ silver, black/ silver or red/ silver. Please advise colour when checking out. This Watermark longboard boardbag has a 5mm eva foam core covered with a tarpee/nylon shell. Small side pocket, padded shoulder strap, carry handle. It has a raised sidewall which gives added protection and results in a smaller footprint and a raised tail to accommodate all fins inside the bag. This bag will take longboards of max length 9'10" x 241/2" wide. Available in either blue/ silver, black/ silver or red/ silver. Please advise colour when checking out. This Watermark longboard boardbag has a 10mm eva foam core covered with a tarpee/nylon shell. Small side pocket, padded shoulder strap, carry handle. It has a raised sidewall which gives added protection and results in a smaller footprint and a raised tail to accommodate all fins inside the bag. This bag will take longboards of max length 9'10" x 241/2" wide. Available in either blue/ silver, black/ silver or red/ silver. Please advise colour when checking out.